Product prices and availability are accurate as of 2019-04-18 23:30:42 UTC and are subject to change. Any price and availability information displayed on http://www.amazon.com/ at the time of purchase will apply to the purchase of this product. 1.S-shape Shoulder Strap:Padded and breathable mesh shoulder straps offer cushioned comfort, while also promoting air circulation along your shoulders. 2.Elastic Band: As an attachment for your sunglasses or hydration bladder tube. 3.3M Reflective Band:The bottom-front loop serves as an attachment point for a bike light or reflector. 4.Compression Strap:Minimize your pack's profile, reduce excess movement, and keep your gear from getting jumbled. 5.Elastic Band:As an attachment for your sunglasses or hydration bladder tube. 6.Sternum Strap:Adjustable sternum strap with emergency whistle buckle. 7.Rain Cover:Integrated rain cover deploys easily. 8.SBS Zippers:High quality zippers, open and close smoothly with each pull. 9.Mesh Padding:Deep and dense padded, 2 long padded areas on the back straps offer cushioned comfort. 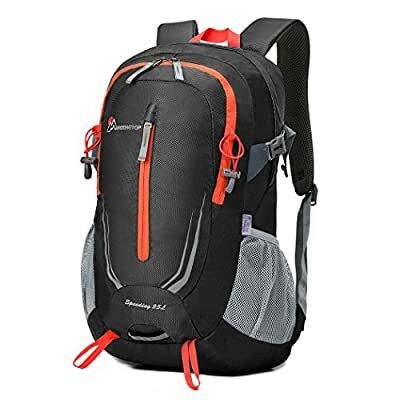 -Secondary Compartment:Large capacity zipped pocket for map, guide book, jacket or other gear. -Hiking Poles Attachment & Loop:Soft latching loop with toggle and bottom loops for ice axe, selfie stick or hiking poles. -Bearing System: Mardingtop bearing system allows air to pass between your back and the pack for a cool and comfortable feeling. -Side Mesh Pocket:Side mesh pockets on both side can hold a water bottle or an powerbar. -WARRANTY- Includes 90 days limited warranty.